That Locus one has been around for a few years now, nothing new. Tonboya's Guts pose is good but the face is whack. 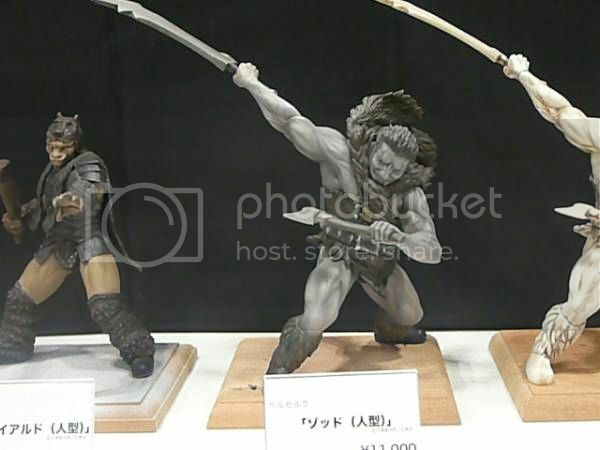 That Human Zodd's pose and the way he's holding the human is really good (close to being straight off the manga)! Though he has muscles in places I've never seen ... looks unnatural but the pose is great and with re-modeling it could be a good addition. That Guts kit in his armor is ... something I'll skip ... he's unnaturally thin in the armor (again, might need re-working/ re-modeling) ... almost looks like he's holding the Dragonslayer while he does the Crab-Walk (http://www.youtube.com/watch?v=E20oSzYOr60). Also, for back to back new posts, please try to Edit your first post rather than making another one? Thanks for the update man! It isn't a re-paint, just the regular 1/6 2010 version (here's my post with pictures of it ^_^ - http://www.skullknight.net/forum/index.php?topic=11864.msg191840#msg191840). Griffith's colors, how so? I see, it just looks so light colored... But I have only seen Version 3 and Black version in person, didn't know the difference between versions was so big. Check that topic out for other pictures, they look better and darker than mine because I practically used to keep mine in Auto mode and some pictures would have Flash, some wouldn't plus my apartment had yellow lights back then. Armored_Berserk's pictures should give you an indication of the color. I know about those other colors, but yours set me off a bit that's all... I thought it might have been a custom repaint or something. I've never seen this kit of Zodd before, looks great. It actually came out 5-6 years ago for a few WF's, but then went out-of-print for a while. I thought it was an awesome kit too, but then when I received it back then, it ended up being pretty small, and the face is unfortunately not up to par. With the right tweaks, it could be a beauty though!